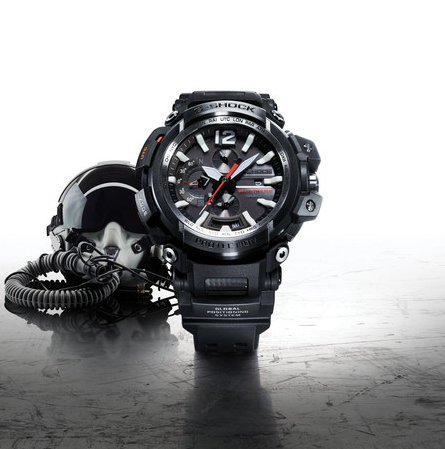 Casio debuted a G-Shock smartwatch at Baselworld last week that costs as much as a first-class flight to Tokyo. The $7,400 MRGG2000HT-1A, a special edition timepiece, is purported to “demonstrate the best in Japanese innovation and craftsmanship,” according to a statement from the company. The MRGG2000HT-1A features three-way time sync capabilities and G-Shock’s GPS Hybrid Wave Ceptor technology, which accurately measures time and location from anywhere on earth. The watch pairs with a proprietary mobile-phone app, and the device’s time setting can be adjusted directly through the app. The watch, which is housed in a 49.8 mm case, comes equipped with G-Shock’s signature shock and 200 meter water resistances, as well as world time (39 cities + UTC), an LED “super illuminator” light, a daily alarm, a full auto calendar, and automatic date-update capabilities. It’s set to go on sale this September.